CANTON, MA (June 13, 2016) – Dunkin’ Donuts’ signature coffee, donuts and sandwiches are now available for purchase on-the-go using a mobile device nationwide. The brand announced that On-the-Go Ordering is now available exclusively for members of the Dunkin’ Donuts DD Perks® Rewards Program at Dunkin’ Donuts restaurants throughout the country. DD Perks members can order, pay in advance with a swipe of a finger on a smartphone, and then skip the line in store to pick up their favorite menu items. With On-the-Go Ordering, DD Perks members can place a mobile order up to 24 hours in advance, select their desired location, and then simply confirm via the new Dunkin’ Donuts Mobile App when they are ready to pick up their order inside the restaurant, or at the drive-thru. The order is automatically paid for using their Dunkin’ Donuts Card within the App. In the restaurant, DD Perks Members have no need to wait, as they can skip the line in store and go straight to pick up their items at a designated area. They also have the ability to save their recent orders as a favorite to speed up their next Dunkin’ run. To enjoy On-the-Go Ordering, DD Perks members nationwide must download the newest version of the popular Dunkin’ Donuts Mobile App, called “New Dunkin' Donuts" in the App Store or Google Play Store. Featuring a new, contemporary touch-friendly design, the App is unique for its one-tap order functionality and visual menus. It can be downloaded for free at the App Store or Google Play Store. 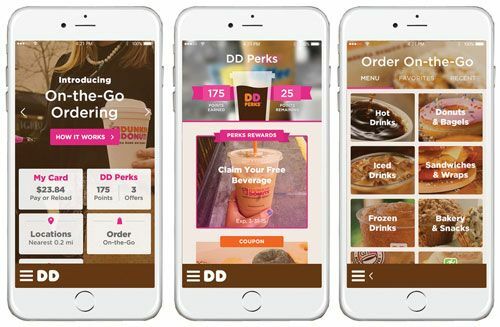 In addition to the On-the-Go Ordering capabilities, the App also lets users access their DD Perks account to find mobile coupons and offers, locate the nearest Dunkin’ Donuts, find nutritional information and more. On iPhone, the DD Perks card supports Wallet and Apple Pay, so Dunkin’ Donuts’ DD Perks Rewards Program members have the ability to receive points by adding their DD Perks card to the Wallet app, and also use Apple Pay to quickly reload a DD Perks card. Touch ID makes reloading even more convenient because guests can add to their balance without having to enter passwords or credit card numbers. To help launch On-the-Go Ordering and emphasize the new increased level of speed of service now available at Dunkin’ Donuts, the brand has turned to Ellen Brennan, the world’s fastest female wingsuit BASE jumper, as part of the new #WTFast campaign, featuring advertising and social video unlike any ever attempted. Wearing a wingsuit in Dunkin' Donuts' signature colors, Ellen jumped from a mountain in France 8,346 feet high, and, traveling at speeds between 115 and 120 MPH, soared towards a cosmetic Dunkin' Donuts storefront especially built into the cliff side to grab a small Dunkin' Donuts bag: the first time a wingsuit jumper has ever grabbed anything during mid-flight. To view this extraordinary video, created by global marketing and technology agency DigitasLBi, visit DDPerks.com/OnTheGo. Following the initial On-the-Go Ordering test in Portland, Maine at the end of 2015, Dunkin’ Donuts expanded the test to participating locations in the Greater Boston area in March, and throughout the Metro New York area in April. Today’s announcement brings On-the-Go Ordering to more than 8,000 restaurants nationwide. To learn more about On-the-Go Ordering and the Dunkin’ Mobile App, visit www.DDPerks.com/OnTheGo.